The Bowflex LateralX is a brand new machine from the well-regarded company, joining the popular Max Trainer and TreadClimber. This one adds a side to side motion on top of the traditional up/down and forward/backward, targeting more muscle groups and giving you a more complete workout. For those looking for something a bit different than the everyday elliptical, these new machines might just have what you are looking for. Bowflex is currently offering two different LateralX models: the LX3 and the more advanced LX5. The base LX3 model is all black with red accents, fixed and moving handlebars, a 7.5" backlit display, grip heart rate monitoring, 8 different resistance levels, and 8 built in workout programs. The up-level LX5 is black and silver with red accents, and adds multi-grip handles, wireless heart rate monitoring (free strap included), 2 more resistance levels, 3 more built in workouts and a stronger warranty. The LX5 also has an adjustable lateral motion vs. fixed on the LX3, and other enhanced touches and features. Both models have a media rack, Bluetooth workout tracking capability, free 12 week workout program including 30 videos, Bowflex radio and a 300 lb. max weight capacity. The LateralX trainers do take some time to get used to, as it is a very unique motion. The only other machines on the market that work similarly are the Octane LateralX trainers, also made by the same company that makes these, Nautilus, Inc. They operate similarly to traditional ellipticals, with the option to work the lower body only by holding the stationary handlebars, or the entire body with the rotating handlebars. The difference is there is a lateral element to your stride, so while you are going up and down, and back and forth, you are also moving side to side. What does this lateral motion accomplish? It's adding a new dimension to the workout, and targeting additional muscle groups in the legs. This makes every step more efficient, and your overall workout more effective. The Octane LateralX machines are very popular in gyms across the country these days...now that there is a more affordable option for the home, it's likely that the Bowflex versions will be just as popular, if not more so. Which Bowflex LateralX Machine Should You Choose? 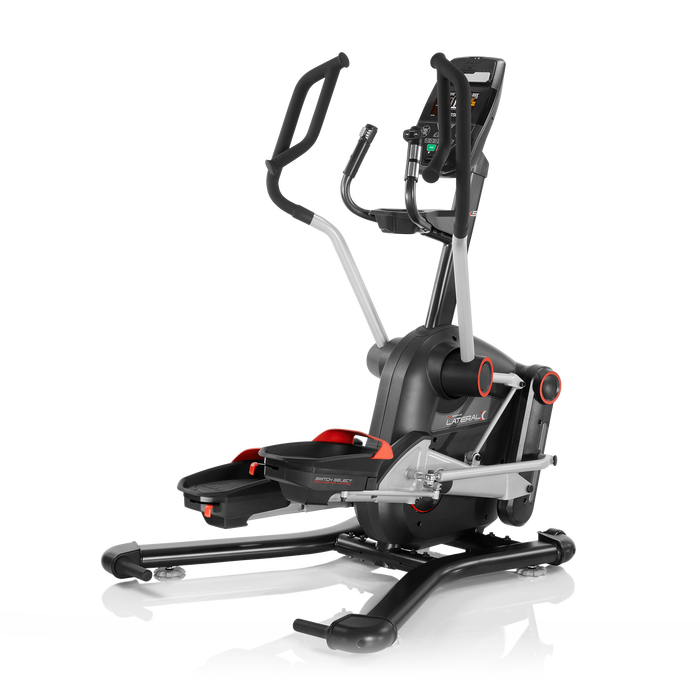 If you have the budget for it, the Bowflex LX5 is the better option simply because it offers a lot more in terms of features and capabilities. It costs around $2,699 or so on sale, and the base LX3 is $1,999. Although it is pricier, it's definitely worth the jump for all that you are getting. You get more workouts, more resistance levels, the ability to adjust the lateral stride and wireless heart rate monitoring. It's definitely a more advanced machine. However, if budget is an issue, then definitely opt for the LX3 instead. 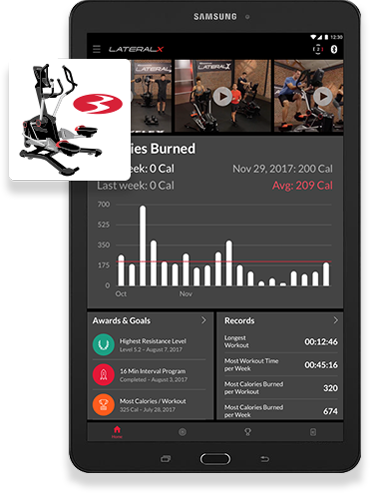 It still gives you plenty of workout/resistance options, you can still track your workouts via Bluetooth, you get the 12 week personal training program and Bowflex radio. So you're still getting the core features and those are the essential ones. Now, there is one additional option and that is the LX5 Performance Pack. That comes with a free Samsung Galaxy E9.6" tablet as well as a free mat. If you don't currently have a tablet, or if you're due for a new one, this might be a very good deal for you. If you already have an iPad or something else however, just opt for the LX5. How Do These Compare to the Max Trainers and TreadClimbers? All of the Bowflex cardio machines are unique, with something for everyone, but the LateralX trainers are most like the traditional ellipticals. 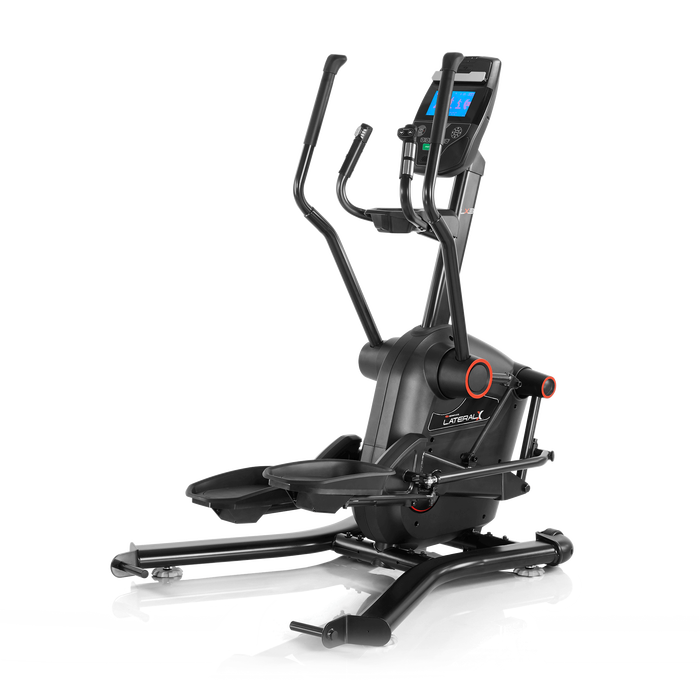 The Max Trainers are like an elliptical combined with a step machine, with a much more compact profile, shorter workout arms and a much more basic display. You can see what they look like above. The TreadClimbers are much different...these are also quite compact, but they resemble a treadmill sliced right down the middle, yet you walk (not jog or run) in an elliptical/stepper pattern. So it's kind of like three machines in one, as opposed to the Max Trainers which are two machines in one. So the new LateralX trainers are most similar to your everyday elliptical machine, just with a 3rd plane of motion (side to side) added to the mix. Everything else about them is essentially the same. Based on our preliminary reviews, we like the new Bowflex LateralX machines. We use the Octane LateralX machines in the gym as part of our cardio routine, and like the extra burn we get from the side to side motion. The Bowflex versions are of course not as commercial-grade as the Octane versions, but keep in mind that those machines cost upwards of $6,000. The gyms can afford them, but most home users can't. So Bowflex is giving you an opportunity to reap the benefits of lateral training, without having to pay a huge amount of money or join a gym. We think people will really be excited about that, and perhaps the LateralX's will achieve the enormous popularity that the Max Trainers and TreadClimbers have. Check out both the LX3 and LX5 to see which one most appeals to you...either one will make a great addition to your home gym. LateralX machines are on sale right now!